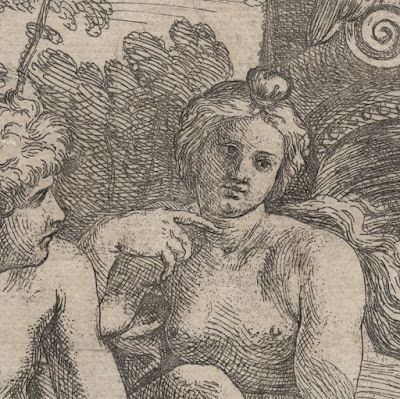 “Venus and Mercury”, 1636, after Nicolas Poussin’s (1594–1665) painting of the same name that is now sectioned with the left side held in Dulwich Picture Gallery, London, and the right side held in the Louvre, Paris. Etching printed with grey ink on buff coloured laid paper, trimmed to the image borderline and lined onto a conservator’s support sheet and laid on heavy wove paper (Dutch Etch). Inscribed with the artist’s name and dated on the tablet at lower left: “FABRITI / CHIARVS / ex 1636"
Wildenstein 1955 121.I (Georges Wildenstein 1955, “Les Graveurs de Poussin au XVIIe siècle”, Gazette des Beaux-Arts, XLVI, Paris); Andresen 1863 348.I (A. Andresen 1863, “Nicolaus Poussin - Verzeichniss der nach seinen Gemälden Gefertigten...”, Leipzig); LeBlanc 2 (Ch. Leblanc 1854 [-89], “Manuel de l'amateur d'estampes, contenant un dictionnaire des graveurs de toutes les nations …”, dl. 2, p. 11, cat.nr. 2). Condition: good impression but with numerous restorations and replenishing of losses, trimmed at the image borderline and laid on two conservator’s support sheets. I am selling this softly glowing etching for the total cost of AU$145 (currently US$111.70/EUR104.02/GBP90.03 at the time of posting this listing) including postage and handling to anywhere in the world. 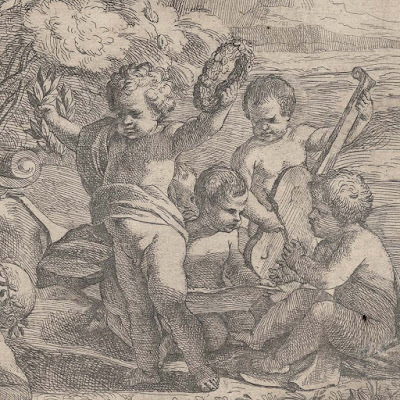 If you are interested in purchasing this rare old-master print and an important historical document of a Poussin painting that is now only to be seen in pieces, please contact me (oz_jim@printsandprinciples.com) and I will send you a PayPal invoice to make the payment easy. 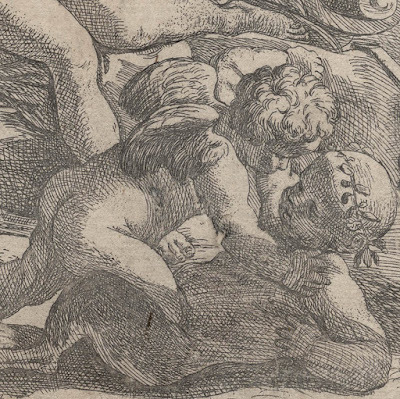 This etching is a curious print that I have not completely come to terms with. First, it is printed in a cool grey ink on warm grey toned paper. 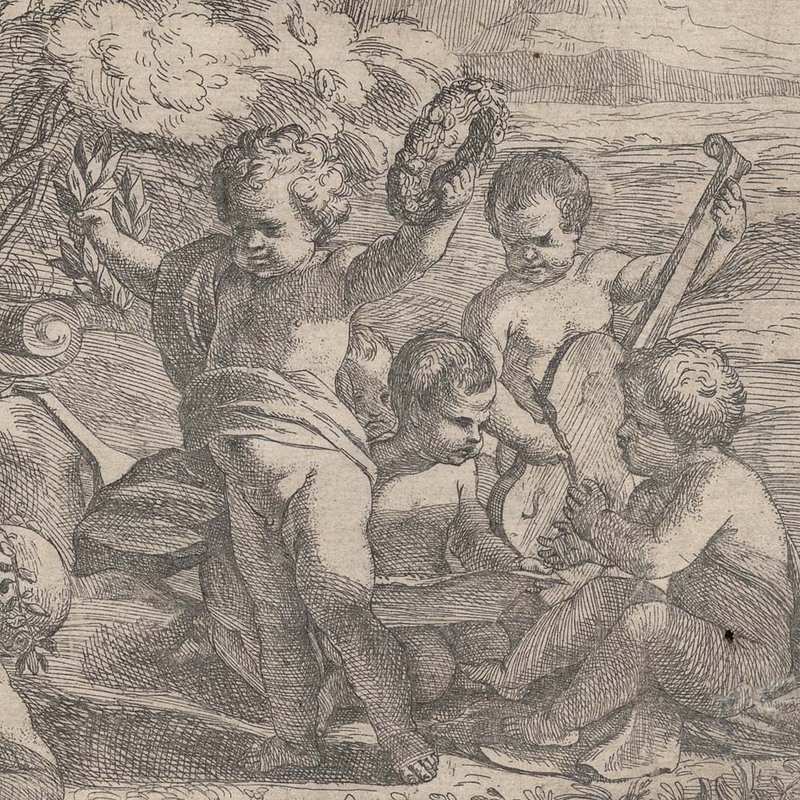 Second, and the most curious issue for me, the description of the copy that the British Museum holds advises that “… at right, group of five putti singing and playing music.” The BM does not post an image of their print but this description fits perfectly with the print that I’m showing here … but there is a perplexing problem: the Rijksmuseum shows the print in reverse and describes their print with the music-making puttie as being on the left. Neither august institution is likely to be wrong as both mirrored impressions are identical (i.e. neither is a copy) but why is there this anomaly? In a way, my first conundrum about the grey toning of the print is probably the answer. This and the copy in the BM (which I am unable to see to confirm my thoughts) is a counterproof (i.e. 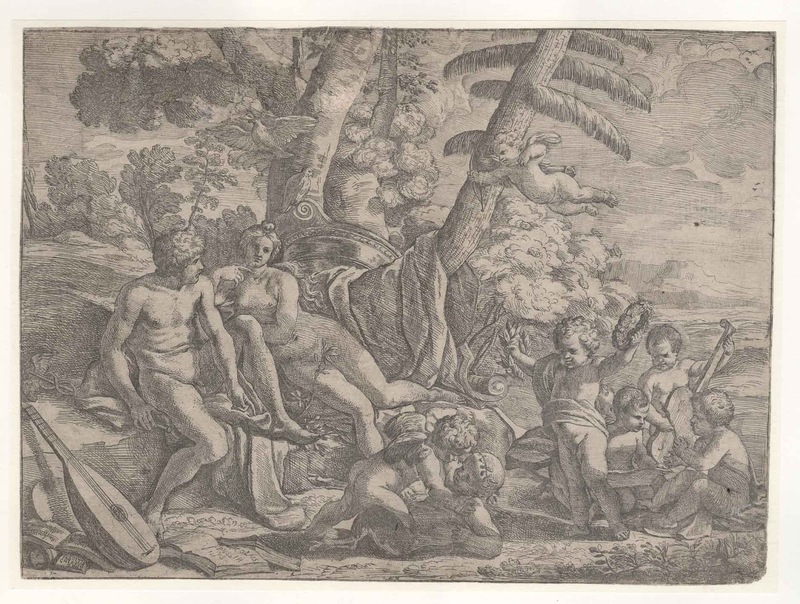 a print taken from the “original” etching when it was still sticky and wet after being pulled from the press by placing the original etching onto second sheet of paper and rolling both sheets back through the press to create a mirror image of the original on the second sheet). This would account for the grey appearance of the print. Do I know for sure? No I don’t as the impression shown here is trimmed at the image borderline but before the platemark that would have shown that it is in fact a counterproof. 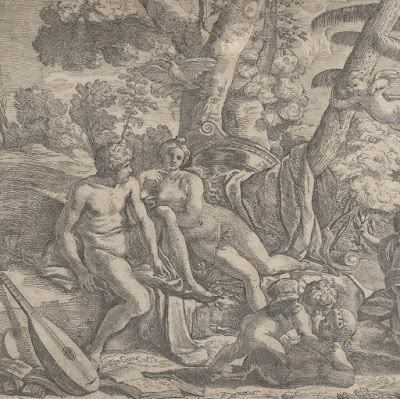 Moreover, the print has been beautifully restored and in the process of this restoration the surface of the print is fattened and so “tell-tale” signs of embossing from the etching plate are not evident.